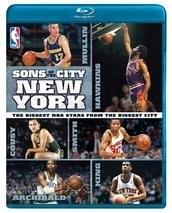 Overview - Sons of the City: New York highlights the greatest basketball players of all-time from New York. From Bob Cousy and Dolph Schayes, to Tiny Archibald and Connie Hawkins, to Bernard King and Chris Mullin, this is a look at the lives and careers of the biggest stars from the biggest city. Loaded with special features and interviews, this is the perfect gift for any NBA or sports fan. 'Sons of the City: New York' is a sports entertainment program that focuses on several major basketball players and coaches who hail from the famous city that never sleeps. Featuring a mixture of archival footage, and newly recorded interviews with contemporary players, retired greats, coaches, and experts, the program spotlights and examines the likes of Bob Cousy, Dolph Schayes, Tiny Archibald, Bernard King, Chris Mullin, Connie Hawkins, Kareem Abdul-Jabbar, and more. While I'm not exactly the biggest basketball fan, I went into this disc with a completely open mind, hoping to garner a greater appreciation for the game and its players. Unfortunately, the short running time and extremely generic presentation make for a fairly banal and uninteresting experience that is mostly disposable. At a mere fifty four minutes, the program races through its subjects. Each player is essentially given a few minutes worth of bullet points about their career and style while we see highlights of their games, and then we're off to the next subject. Adding insult to injury, what is actually said about the players rarely amounts to more than superficial surface insights from talking head interviewees spouting regurgitated sports stats, painful platitudes, empty accolades, dull compliments, and only occasionally interesting trivia. There's only so many times we can hear about how each player is strong willed and has a high basketball IQ, before it loses all meaning. Due to the generic and quick approach, many of the players featured have such similar stories and footage that they sort of blur into one another, and nothing about any one segment really sets it apart from the last. The whole New York angle of the premise is also fairly negligible and comes across as tangential at best. An occasional comment about a certain player spending time on the playgrounds of Brooklyn is thrown in every now and then to remind us that this is supposed to be about players from the city, but it never really serves any purpose or offers any kind of meaningful connection. Overall, this is an extremely shallow and broad look at some great players that offers very little in the way of actual insight into their lives and careers. Though there is some interesting archive footage here and there, and some of the segments do offer a bit more substance than others, 'Sons of the City: New York' is a pretty boring and pointless sports program that lacks any real semblance of creativity or drive. It sort of reminds me of those old VHS compilations of sports greats you'd find in a bin at a dollar store. While I'm not exactly a big sports fan, I have a hard time believing that even the biggest basketball aficionados will find this of any real interest. The only audience I can see for this type of material are kids looking for some brief history on some of the great players of yesteryear. In that regard, the quick but harmless approach might hold some entertainment value, but even then it's fairly lacking. Presented in a 1080i/AVC transfer in the 1.78:1 aspect ratio (though most of the program is actually 1.33:1), 'Sons of the City: New York' really doesn't look so great on Blu-ray. Footage is taken from a variety of sources basically spanning the entire gamut of video recording mediums. The vast majority seems to come from standard definition video with some occasional 8mm and 16mm recordings as well. The film sources show signs of damage due to their age and the video sources show various digital artifacts as a result of the limitations of their medium and the upscaling process. The only scenes that actually come from high definition sources are some of the talking head interviews. These HD interviews are of course the best looking sequences and exhibit a decent amount of detail, but really aren't very impressive. Colors, black levels, and contrast vary wildly between the different sources, and again, look the most pleasing in the few HD interviews edited in throughout. While it's understandable that the archive footage looks the way it does, and there really isn't anything that could have been done to improve it, the fact of the matter is this is a mostly upscaled presentation of standard definition material. As such, the transfer does not take advantage of the Blu-ray medium in any significant way. Though it never looks terrible and is certainly watchable, this is not a strong or even average example of what the format has to offer. The program is provided with an English DTS-HD Master Audio Stereo track with no subtitle options and is about as basic as an audio track can get. Dialogue from the newly recorded interviews is clean and easy to understand. Some of the archive footage exhibits some pops and static. Dynamic range is completely flatlined, bass is basically nonexistent, but balance between what is presented is adequate. There is no real directionality to speak of and the soundtrack itself consists of rather annoying and generic repeated music. Basically the audio allows one to hear the content of the program cleanly, but does absolutely nothing else. Overall, a serviceable but lackluster track. There's actually a decent assortment of supplements here, consisting of several uncut interviews with many of the players, coaches, and experts featured in the film, that all prove to be much more insightful than the actual program. All of the supplements are provided in 1080i with Dolby Digital stereo sound but appear to come from upscaled standard definition sources unless otherwise noted. Basketballography: Dolph Schayes (HD, 15 min) - This is an extended, in depth interview with Dolph Schayes. Though some of the footage was used in the main program, most of the material is new and provides a much more interesting look at the player recalling his career with more archive footage spliced in. NBA Legends with Johnny Hoops: Bernard King (HD, 23 min) - This is an in depth one on one interview with Bernard King. Like the previous supplement, this provides a much more detailed look into the player's life and career and also features more archive footage. This is also the only feature that appears to come from an actual HD source. Vintage Interview Extras (HD) - Five more brief interviews are included here with several of the participants featured in the main program discussing other players. The interviews included are Phil Jackson on Red Holzman (4 min), Pat Riley on Red Auerbach (4 min), Lamar Odom on Connie Hawkins (3 min), Kenny Anderson on Bernard King (3 min), and Tim Hardaway on Nate Archibald (3 min). In the end, 'Sons of the City: New York' is an uninspired and wholly conventional basketball program with a running time far too short to offer anything of real significance. The video and audio are both subpar but watchable, and supplements are actually a little bit more interesting than the main program. Unfortunately, there really isn't much value here and I think this is one even fans will want to skip.